Do you think you could give this little fellow here a new eye-catching, funky monsterlicious look for him to stand out from the crowd of cute little monsters with? Well, then start its makeover by picking a new lovely candy color for its skin, then see which one of those goofy-cute looking monster eyes would double its loveliness, what cool little horns would suit him best and, of course, what heart-melting smile, completing its adorable face expression, is more likely to turn him into the most adorably chic, most charismatic tiny creature leaving in Monsterland! Don't forget to complete its goofish sweet look with a nice pair of tiny cute or long, attention-grabbing ears, too! 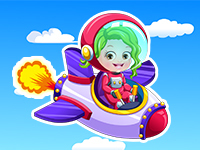 By the time you finish off its brand new funky-glitzy look so that the little buddy should set itself apart from all the other little monsters in his fantasy world, you will definitely come to the conclusion that this is one of the catchier free doll dress up games that you've ever played!